The next time you see a good deal on potatoes stock up on a couple of 5 lb bags. In about an hour you can have your refrigerator stocked with 5 different types of potatoes. Ready for a busy weeknight or Sunday dinner. Peel, and dice potatoes. Drop diced potatoes into a pot of boiling water and boil for two to three minutes. Drain in a colander. Allow the potatoes to cool. Arrange your potatoes on a baking sheet, freeze in a single layer. Put baking sheet into freezer and let potatoes freeze solid. Divide into freezer bags leaving ½ inch of space for expansion. Place back in freezer. To prepare place in non-stick pan with oil, add salt and pepper to taste. Fry till golden brown. Peel, and grate potatoes. Spread potatoes in a single layer or shape into individual servings. Allow to freeze completely. Transfer to freezer bags and place back in freezer. When ready to prepare place in non-stick pan with oil, add salt and pepper to taste. Fry on each side for 5-7 minutes. For a 5lb bag; Place potatoes in a large saucepan and cover with water. Bring to a boil. Reduce heat; cover and cook for 10-15 minutes or until tender. Drain. In a large bowl, mash potatoes with butter. Beat in1 cup of sour cream, 4 oz. cream cheese, 1/2 tsp. garlic salt, salt and pepper to taste. . Allow to cool. Put 1- 1 ½ cup scoops on a baking sheet, place in freezer. When completely frozen remove from pan and place in freezer safe bag. Thaw in refrigerator, bake in oven for 30 minutes at 350°. Check out this recipe for Freezer Friendly Garlic Mashed Potatoes. For a 5lb bag; wash potatoes and pat dry. Place potatoes on a baking sheet and spray with non-stick spray. Sprinkle potatoes with kosher salt. Bake potatoes at 350° for 1 hour to 1 hour and a half, or until potatoes give when squeezed. Set aside to cool. In a large mixing bowl combine; ½ cup butter, 3 oz. cream cheese, 2 tsp. salt, and 1 tsp. pepper. Carefully cut potatoes in half lengthwise. Scoop out inside of potato leaving a thin layer attached to skin. Add potatoes and 1 cup of milk to mixing bowl, to the consistency of thick mashed potatoes. Cradle potato shell in your palm, and fill with mixture. Sprinkle with shredded cheddar-press into filling to make it stick. Lay potatoes back on cookie sheet, cove and place in freezer. 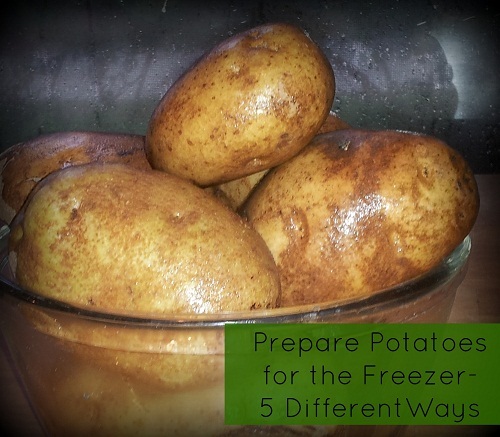 Once solid, you can wrap individual potatoes in plastic wrap and place in large freezer bag. When ready to use cook at 350 for 45 minutes loosely covered with foil. Remove foil and cook another 15 minutes. Label with date and cooking directions using a sharpie marker. If desired, Peel the potatoes with a vegetable peeler. Slice potatoes lengthways into fries about ½ “. Toss sliced potatoes in just enough vegetable oil to coat. Sprinkle potatoes with salt and toss them until they are well-coated. Spread the potatoes out in a single layer on a baking sheet. Bake fries for 20 to 55 minutes, turning them once about halfway through the cooking time. Remove the fries from the oven and set them aside to cool before freezing. Place the fries in a freezer bag. Also, check out this freezer friendly recipe for Potato Chowder. Ӏt’s really a cool annd helpful piece оff information. I’m satisfied thazt үou simply shareed tɦis helpful infoгmation with us. Pleаsе keep uss up tօ Ԁate like this. Thanks for sharing. Wonder if these same techniques would work for sweet potatoes as some of us can’t eat white potatoes if low carbing..
Wonder if these same techniques would apply to the processing of sweet potatoes for those of us who can’t eat white potatoes?